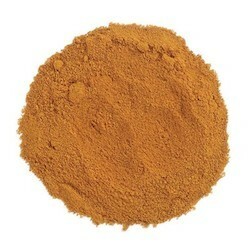 Organic Ground Turmeric Root has a minimum 4% curcumin content. It is golden-yellow in color, with a pungent earthy, distinctive aroma. Its flavor resembles both ginger and pepper. Indispensable in curry powders and East Indian cooking, turmeric is also used in prepared mustards and pickles, dressings, eggs and rice dishes.